Banff has been our backyard since the day we were born. But JJ and I did not appreciate it for what it was until much, much later. As young teenagers, we spent our winters talking smack about the kitsch shops and “altitude attitude.” Only over the past few winters that we began to understand why exactly millions (yes, millions) of people pass through the gates of precious Banff National Park each year. It’s because it’s goddamn beautiful—the resorts have bountiful amazing terrain and the light snow we’re all after. All that tourist stuff aside, what we really want (on top of great snow and natural side hits, obviously) is to ride some amazing parks. Transitions, jumps, creative rails, basic rails to learn on. All of these attributes combine to make something that we can lap day after day. And trust me, we do. If you’re snowboarding in Banff, it’s going to be at one of the Big 3: Norquay, Sunshine Village and Lake Louise with each resort brings a unique flavour to their park. There are always gangs of people lapping the parks, regardless of weather. These gangs spread out over numerous chairs, and there’s a group for all skill levels and speeds. Gotta get in where you fit in. The scene in Banff is built on the shoulders of a deeply rooted community. Shout out to Rude Boys and Unlimited for holding it down. In that light, I have to mention Rude Girls, and what they are doing for the Bow Valley women’s snowboarding scene. They almost always have the biggest crew on the hill and are always learning new stuff and hyping each other up. The town of Banff is both quaint, yet infested with tourists. This mix and match actually can be really interesting and fun, as long as you can practice some patience. This interesting demographic also means you can hit a hostel for the low or ball out on a seriously nice hotel. Bumpers Inn is a classic cheap hotel spot we stay at. Regardless of where you want to stay, be sure to plan in advance because last-minute housing options can be extremely limited. Banff is small enough to walk around for food and nightlife, and there are buses that go to all of the mountains. These buses are free with the purchase of a lift ticket. Bonus. Now that you’ve got the brief rundown, let’s get into it and see what’s good with the parks in the park. Lake Louise may be the farthest from Banff, but worth the drive. A little under 40 minutes out, you’re rewarded with an insanely beautiful backdrop and the longest park lap on the Big 3. Right off the bat, you can see the lowest park from the lodge at the base, which is exciting. Glacier Express is a nice quad that will take you to the bottom of the tree line, with the Lake’s three parks making their way down through the trees. This lift crosses over each of the different parks, which is a great feature for tracking down your friends. The first park, Upper Triple Bridge, has predominantly beginner features. You pop out and cruise the run a bit before ducking into Lower Triple Bridge for a slightly more elevated experience with bigger features. That ends quickly enough and you’ll have some time to slash and carve until you come to the final park, and home of the majority of Lake Louise’s park focus. BLVD is a huge park that is not only long, but also wide enough to be broken into three main lanes. The XL jump line, a huge slew of big, classic park rails/features and then a laid back chiller section on the far side. The jumpline here is the biggest and best flowing jumps in the Bow Valley, so if its airtime you’re after, this is it. The BLVD park takes you right down to the base of Glacier Express. This is technically the only lift you’d need to know to ride the park at Lake Louise, but it’s situated so that you can almost always catch some quick hits on the way down from wherever you want to ride. Lake Louise has good, fairly forgiving rails of all sorts and kinds, which is why a lot of people say it’s the best place to get your footing riding park. Beverages flow smoothly at the Kokanee Cabin, which happens to be directly at the base of the park chair. It also works out well for those nice days and where you can have a drink outside and watch people lap the big jumps. The local scene at Sunshine has noticeably grown over the past few years. The best thing about Sunshine is the overall vibe. It’s really different than the other resorts because you have the ride up a gondola to get to the hill. That gondola ride is perfect for that morning coffee and banter about what went down the week (or night) prior, as well as confined stretching and boot tying sessions. The gondola also facilitates the cherry on top of Sunshine Village, which is the ski-out. A side hit riddled run on the way down, best enjoyed with as many friends as possible. The perfect way to end a day. In the spring, we like to hike out of side door off Wawa and ride some side mountain terrain until you meet up with the ski-out about halfway down. 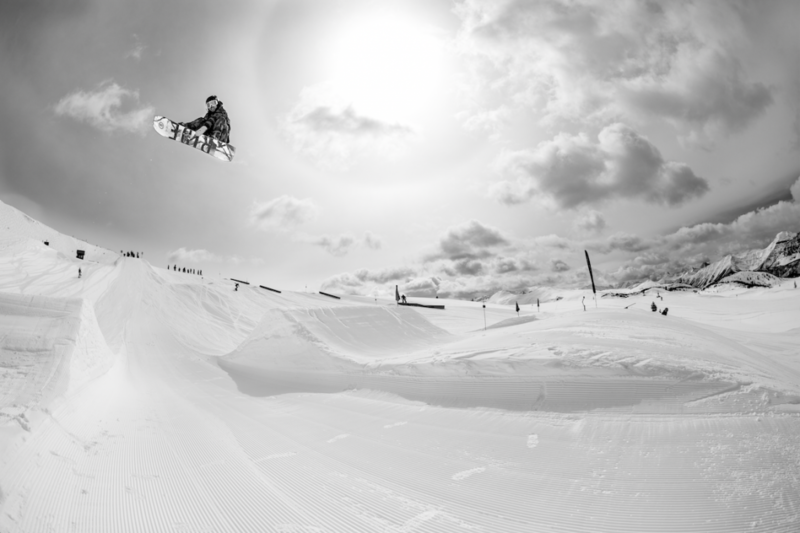 Sunshine has a dedicated park staff that has been refined and inspired over the past two years since hosting Krush and the Snowboy Productions crew for the legendary Holy Bowl-Eh and more recently, Dawn of The Village. There has been a noticeable increase in the transitioned rideable terrain in the park, which is something we can all get down with. 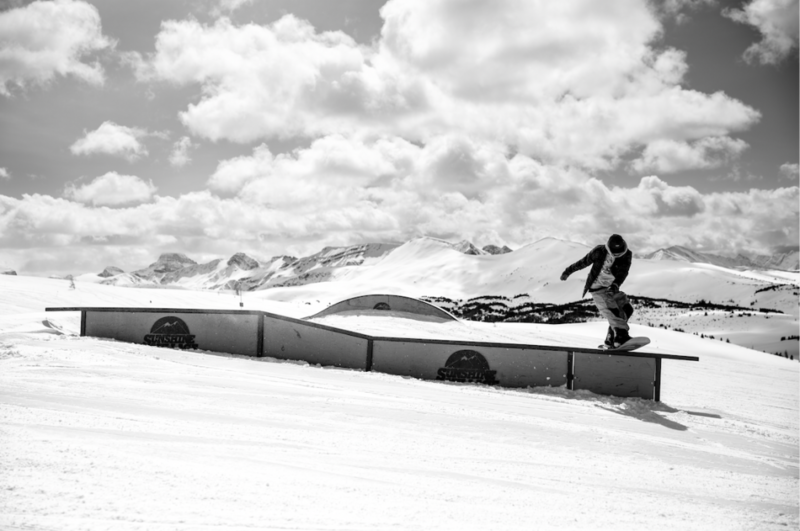 “It’s crazy to think about the small rail jams we used to host several years ago compared to hosting Holy Bowl-Eh last year,” says Sunshine Village terrain park designer and builder, Ben Surrallik. Sunshine Village sets itself apart from its Big 3 counterparts with these progressive snow features and rail zones. They come through with a banging preseason park off of Strawberry (one of their beginner lifts close to the lodge) and then mid-December move it over to Angel, where things pop off. Shortly after, they expand to include the Grizzly and Spring Hill parks. These lower terrain parks are split up in a cool way so that you can lap either Angel chair or the Continental Divide. If you happen to be up there and experiencing less-than-ideal conditions, you can traverse over after the main park and lap the first-ever heated chairlift in Canada (Tipi Town), or duck down into the trees and ride the Jack Rabbit kids play park under Wolverine chair. There you will find super small rails on a nice winding run in the trees, perfect for slapping some base on metal on those alpine whiteout days. Did we already mention there is a heated chairlift?! Norquay can be viewed as the “home” resort of Banff, as it’s the closest to the town. Therefore, the most convenient place to catch quick park laps before or after work. You rally up a serious network of hairpin turns to get there so make sure to have your winter tires on. There’re some pretty fire lookouts on the way up where you can look over the whole valley. It’s a crazy perspective of Banff and I would recommend stopping for a view. Norquay has two huge selling factors, first one being that it has a dedicated park lift with an unobstructed view of the action and plenty of opportunity for heckling your friends off the lift. It’s not a very long run, so you get a little break on the way up but not to the point of boredom. The second factor, which sets Norquay apart from the rest, is that they have night riding. Open Friday and Saturday nights, it’s the place to go for some mellow laps to warm up for the weekend or even an on-board pregame for the night ahead. They also sell a really affordable night pass for the season. Once the boots are loose, the Lone Pine Pub in the lodge is the place to go; they even have their own beer on tap, brewed by the Banff Ave Brewing Company. Norquay also consistently comes through with the earliest opening day and always has a few mellow rails and boxes set up to get the cylinders firing. For under $10, you can soak your sore muscles in the highest operating hot springs in Canada. You don’t even have to leave town, it will get you feeling proper for the next day of boarding. They even rent swimsuits and towels if you didn’t remember to pack yours. As the dive bar of choice in Banff, the Devil’s Gap is the obvious place to go for a game of pool and a few cold beverages. This place always has cheap drink specials and a snowboard video playing. It’s common to see the owner, Potato, ripping one of the resorts by day before catching him behind the bar in the evening. If you’re feeling on your A-game, challenge him to a game of foosball—good luck! If you are trying to really loosen up, the Sasquatch is the place to go. As the only remaining club in Banff, things can get hectic in here, so make sure to know what you are signing up for. If you catch it on a good night, this place goes. Monday night pizza, Tuesday night calzones. They go for $12, which is amazing for Banff standards and it’s good food. This summer, Banff upgraded from a dilapidated wood mini-ramp to a brand-new concrete skatepark. It’s a Newline park, so you know everything is dialled in proper and is definitely worth checking out. Springtime boarding in the area just got revamped. Swap out your snowboard for a skate after the lifts stop turning and keep ripping with your homies all evening long.